This is the thing about quiche. (Yes, there is at least a thing or two about quiche.) People are impressed by quiche. People think you are a very fancy cook indeed, if you can make quiche. I am (obviously, to those of you who have been following along) not a fancy cook. But I can make quiche – and so can you. In fact, I’m going to go ahead and say that another thing about quiche is that it is one of the easiest dinners you can make. And it is endlessly variable, so you will never be bored by quiche. 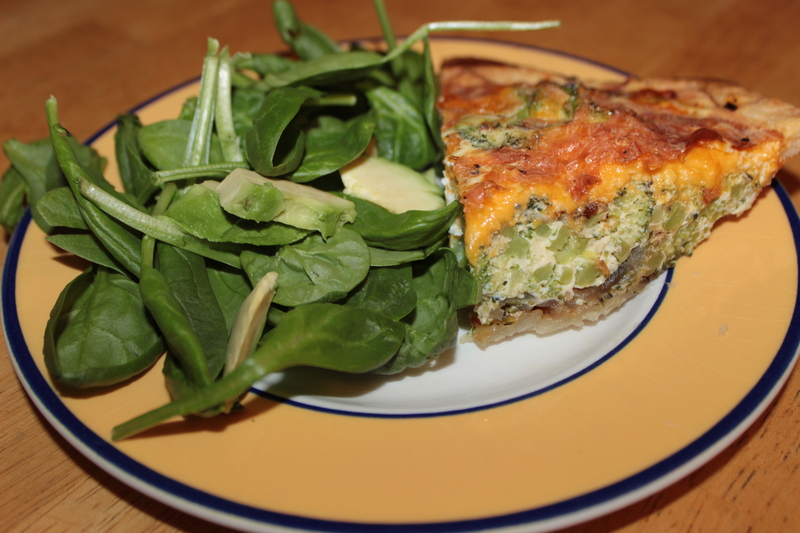 Tonight, I make a few tweaks to a quiche I made a few weeks ago, with equally tasty results. 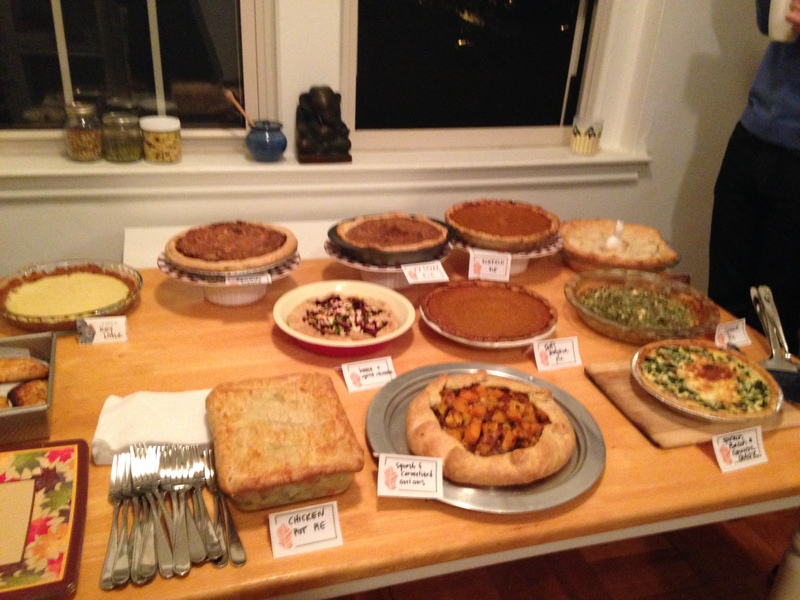 Unroll the pie dough and press into a pie plate. Because it is a filled pie, no need to pre-bake or prick with a fork. Microwave (I know! So not fancy!) your broccoli florets in the bag for about 2-3 minutes. Note: This will make your broccoli a bit more like the consistency of the rest of the quiche – if you like your broccoli crunchy, skip this step. In a large skillet, heat the oil, and then cook the onions until translucent. Toss in the broccoli; add some pepper and some crushed red pepper, if you’re into the heat. In a small bowl, lightly beat together the eggs and about a cup of light cream (again, you can pretty much use any dairy just to fluff up the eggs a bit). Season with salt and pepper. Pour the veggies mixture into the pie crust and spread evenly. Pour the egg and cream mixture over the veggies; spread evenly. Top with a generous handful of shredded cheddar; make sure to press at least some of it into the mixture below. One of the best parts of living in the same city as our undergraduate university is the fact that we continue to be surrounded by friends we’ve known for years – some of them for more than a decade. And one of the best traditions to come from our long stint in this city is an annual Piesgiving, hosted by our friends J & N. This tradition has its roots in a meatball cook-off nine years ago, and has since evolved into less of a competition and more of an excuse to get together before Thanksgiving and stuff our faces with pie instead of dinner. As soon as bright orange cans of pumpkin start gracing the grocery store shelves, the Husband starts slowly, and then more incessantly, requesting pumpkin pie. I have been making him one of these at least once a year for the past 7 or 8 years, sometimes tweaking the recipe, sometimes making a homemade crust, and sometimes combining with other ingredients, such as sweet potato. The original (from the back of a can! ), though, tends to be the favorite. This year, I was majorly excited to use my new pie crust shield (thanks, wedding registry!). The look of sheer joy and delight on his face makes it worth it every time, despite the fact that I don’t even like pumpkin pie. Now that’s love. He just has to share with the rest of the Piesgiving crew. Roll out the pie crust in a 9 inch or so pie dish. (Do not prick the crust). Mix sugar, salt, cinnamon, ginger and cloves in a small bowl. In a separate, large bowl, beat the eggs together and then stir in pumpkin, the spice mixture, and the evaporated milk. Pour the pumpkin mixture into the pie dish; you may have a bit of extra. Don’t overfill the crust or it may bubble into your oven and likely burn…setting your fire alarm off…(not that this has ever happened…). If not using a crust shield, cover the crusts with aluminum foil before you stick it in the oven (this is so you don’t burn yourself later!). Take the pie out, and if using a crust shield, now’s a good time to place it over the pie crust. Reduce the temperature to 350 degrees and return the pie to the oven to bake for another 40-50 minutes, depending on your oven. Cool for about two hours and serve warm OR cold (the Husband prefers his cold, for breakfast). While it feels good to be back in the kitchen again, I’m taking off for a work trip on Tuesday afternoon…which means there’s no menu plan for this week. (Caveat: the Husband has a plan that involves lots of Italian – pizza, pasta, and stromboli, which I hope he’ll post as his work schedule allows). That being said, I spent a lot of time in the kitchen this weekend, and so I’ll be updating recipes on here throughout the week. Last night was the first time since starting this blog that we’ve had more than just the two of us at the dinner table. So we busted out our secret weapon: the crockpot. The Husband has been a firm believer in the crockpot since before we started dating. And while I had some doubts initially (doesn’t all the food turn out mushy? ), I have joined the ranks of the converted. Nothing is easier than set it, forget it, eat it. So that’s exactly what we did, plus a few bottles of wine, to delicious results. If you have the time, sear the pork loin in olive oil until browned on all sides before putting it in the crockpot. It will give it a better, deeper flavor. Place the pork loin at the bottom of the crockpot, pour the chicken stock over the pork and mix in the rest of the ingredients, through the red pepper. Set on low and cook for 8-9 hours. Go to work! With about 20 minutes to go, warm some olive oil in a saute pan, cook down the onions. Add some salt and pepper (and if you’re like us, some more crushed reds! ), and then a large bunch of arugula – it will cook down significantly! Slice the loin and serve in a shallow bowl, topped with some of the cooking liquid, a slice of mozzarella cheese, and the greens and onion mixture. The cheese will melt and the greens will add both a spice and a texture to the pork – which should be delicious on its own! The Husband first made this meal for me after I returned from three months of living away from him. It was delicious then, and it was delicious now. 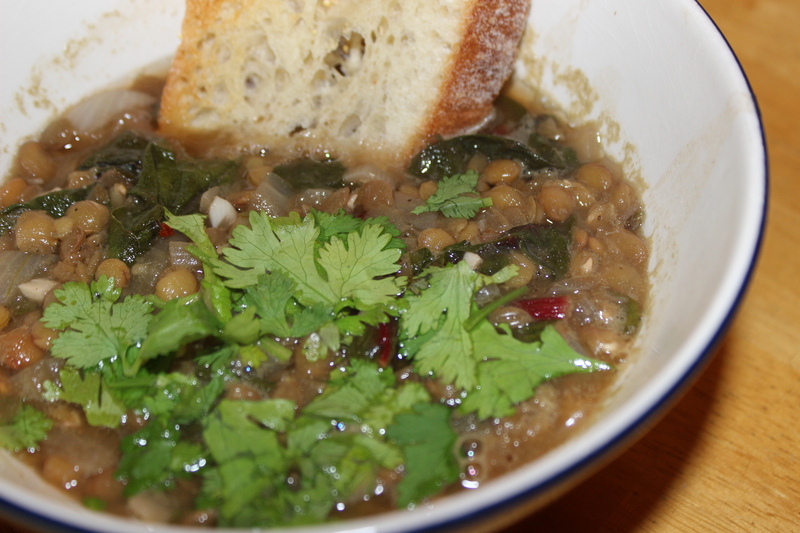 This is definitely a go-to for easy, relatively elegant, hearty food. After an amazing weekend with (both sets of) parents, I had a glorious day off for Columbus Day. I had big plans: catching up on bills, cleaning the house, doing laundry, switching out the fall clothes, grocery shopping, hitting the gym and of course, cooking. Instead, I watched all eight episodes of Outlander (thanks, Mom). And then I did a few things on the list, namely, grocery shop and cook dinner. What follows is the first time I think I’ve ever baked anything without at least loosely following a recipe. And it was good! Unroll the pie dough and press into a pie plate (I used one with the bottom that slides up and out); discard excess dough. Because it is a filled pie, no need to pre-bake or prick with a fork (more on that later). In a large skillet, heat the oil, and then cook the onions and shallots down, until translucent. Mix in the mushrooms and cook those down, as well. Add some pepper and some crushed red pepper, if you’re into the heat. On the side, lightly beat together three eggs and about a cup of light cream (really, anything with at least a little bit of fat will do – whole milk, half and half, etc. Season with salt and pepper. 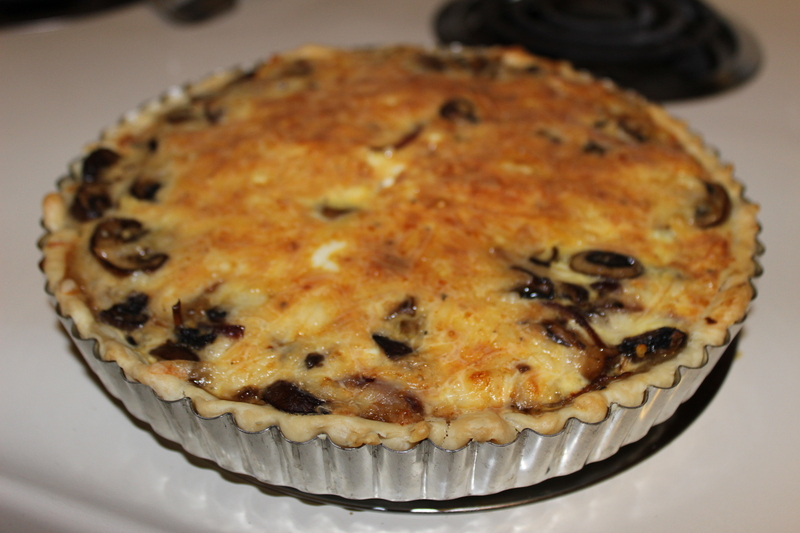 Pour the cooked mushroom, shallot and onion mix into the pie crust and spread evenly. Pour the egg and cream mixture over the mushrooms; spread evenly. Top with a generous handful of shredded gruyere; make sure to press at least some of it into the mixture below. Serve with a light salad! The Verdict: I’m pretty pleased with myself, another go-to! This was delicious, and the leftovers will keep for lunch. And there are almost endless variations to this – swap in and out various vegetables, or add bacon or pancetta, truly an expansive range of possibilities. The Husband, despite not liking eggs, also declared it tasty – though he did comment the crust at the bottom was a little soggy in places. I wonder if this is because the mushrooms let out a bit of moisture as they cooked down further? Would I have done well to pre-bake or prick the crust, even just a bit? Welcome feedback from more experienced chefs!